Cobar is a town in central western New South Wales, Australia. Start off your visit on the 30th (Thu): contemplate the long history of Mount Grenfell Historic Site, then get outside with Cobar Memorial Swimming Pool, then take some stellar pictures from Fort Bourke Hill Lookout, Peak Gold Mines, and finally stroll through Cobar Miners Heritage Park. 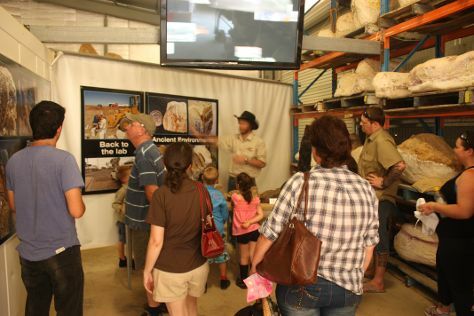 Keep things going the next day: take an in-depth tour of Great Cobar Heritage Centre. For traveler tips, maps, more things to do, and more tourist information, you can read our Cobar trip itinerary maker tool . Yarrawonga to Cobar is an approximately 6.5-hour car ride. Expect somewhat warmer temperatures when traveling from Yarrawonga in May; daily highs in Cobar reach 24°C and lows reach 9°C. On the 31st (Fri), wrap the sightseeing up by early afternoon so you can travel to Charleville. Charleville is a town and locality in the Shire of Murweh, Queensland, Australia. For more things to do, maps, and other tourist information, read our Charleville online trip planner . You can drive from Cobar to Charleville in 7 hours. Traveling from Cobar in May, you will find days in Charleville are a bit warmer (29°C), and nights are about the same (11°C). You will leave for Winton on the 1st (Sat). Winton is a town and locality in the Shire of Winton in Central West Queensland, Australia. On the 1st (Sat), examine the collection at Australian Age of Dinosaurs, then examine the collection at Waltzing Matilda Centre, and then examine the collection at Qantilda Museum. To see reviews, traveler tips, other places to visit, and more tourist information, go to the Winton tour planning app . Drive from Charleville to Winton in 7.5 hours. Alternatively, you can fly. Finish your sightseeing early on the 2nd (Sun) to allow enough time to travel to Mount Isa. Start off your visit on the 2nd (Sun): get all the information you need at Outback at Isa and then head outdoors with Telstra Hill. To find other places to visit, ratings, reviews, and other tourist information, use the Mount Isa day trip planning site . Drive from Winton to Mount Isa in 5 hours. Alternatively, you can fly. In June, daily temperatures in Mount Isa can reach 29°C, while at night they dip to 11°C. You will have some time to spend on the 3rd (Mon) before leaving for Mataranka. Mataranka is a community of about 400, in the Top End region of Australia's Northern Territory. To find reviews, other places to visit, and tourist information, read our Mataranka vacation planner. Traveling by car from Mount Isa to Mataranka takes 14 hours. Alternatively, you can fly. On the 4th (Tue), you're off toDarwin. Eschew the tourist crowds and head to Wangi Falls and Adelaide River War Cemetery. Explore the numerous day-trip ideas around Darwin: Fogg Dam Conservation Reserve (in Humpty Doo), Florence Falls (in Litchfield National Park) and Litchfield National Park (in Batchelor). Spend the 5th (Wed) wandering through the wild on a nature and wildlife tour. And it doesn't end there: make a trip to Nightcliff Jetty, examine the collection at Defence of Darwin Experience, look for all kinds of wild species at Crocosaurus Cove, and admire all the interesting features of Hidden Valley Motor Sports Complex. For photos, reviews, where to stay, and other tourist information, read Darwin itinerary builder app . Explore your travel options from Mataranka to Darwin with the Route module. Expect a daytime high around 36°C in June, and nighttime lows around 24°C. Finish your sightseeing early on the 11th (Tue) so you can travel back home.